Bizarre things, ioun stones. Find out about some new and interesting ones here. 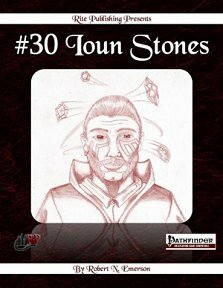 Publisher's blurb: "With #30 Ioun Stones you'll find new options to swirl about the head of a character in a winding gyre, setting your character apparet with a blazen display of magic. Best of all they don't even take up slot so you never have to worry about which ioun stone you want to take. Pick up magic items whose rich history predates the world's most popular roleplaying game having found its inspiration in the stoires of Jack Vance. "Pick up stones whose orbit causes whirlwinds, or ones which travel like messenger birds, or even those that seek out the enemies of thier master. Also discover the ioun stone of legacy known as The Master Finch."